Having friends in far away places is always a good thing. Different viewpoints, different ways of life and different ways of cooking! 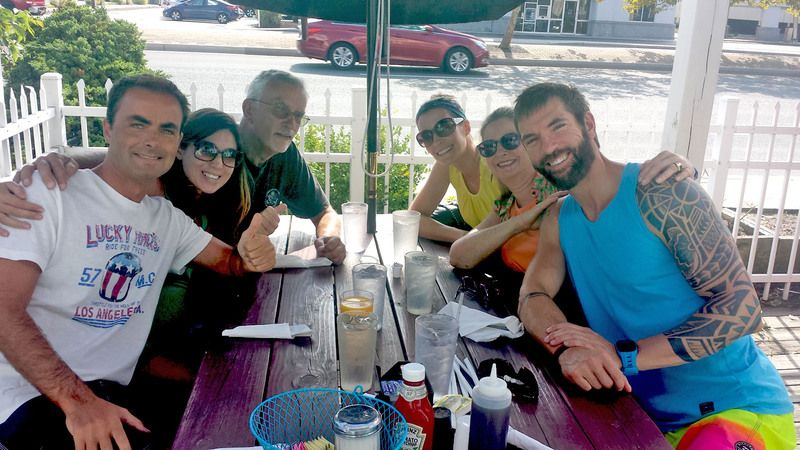 Our italian friends from Rome, Anna and Roberto, vacationed in the US this past month (ahhh, to have a month-long vacation). On their way back to the airport they stopped mid-way to their destination at my parent’s house on the Eastern shore. We took them out for an American breakfast (chocolate chip pancakes! ), went to the beach and played some futbol (both European and American), lastly heading off to the grocery store for ingredients for dinner that night. We decided on two pastas because two is ALWAYS better than one, right?? Cacio e Pepe (sort of like a rustic and salty macaroni and cheese due to the Pecorino cheese) and Amatriciana, traditionally made with guanciale (pork cheek), tomato and pecorino cheese. We couldn’t find guanciale (I’m determined to make the recipe with it in the future) so we settled on pancetta. We also had a tough time finding the “perfect” Pecorino cheese. We tried several at a deli near my parents but Roberto repeatedly exclaimed, “This isn’t pecorino!” with a shocked look on his face after testing each one. We finally bought two but pretty sure they weren’t up to par even if the lady behind the counter stated, “Well, it does say pecorino on the label.” It was quite hilarious actually. I get Roberto’s reasoning though. If you are only going to have 2-3 ingredients, they must be of the best quality. I went to the grocery store on our way back to the house and found one with “Made in Italy” on the label. Once Roberto saw that he declared, “Yes, this will work!” Made from sheep’s milk, pecorino is a salty, hard cheese and absolutely delicious. 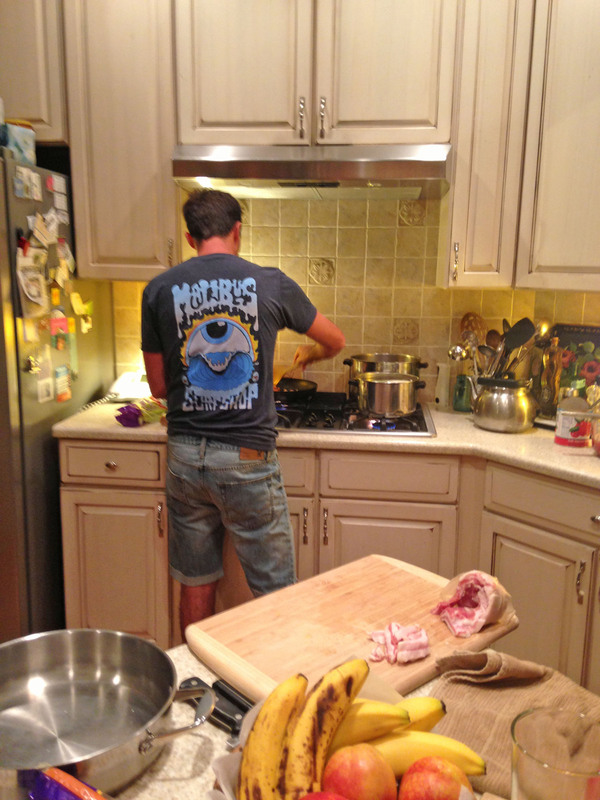 Once we got the shopping out-of-the-way, it was time to cook! For the Amatriciana we used two cans of San Marzano tomatoes. 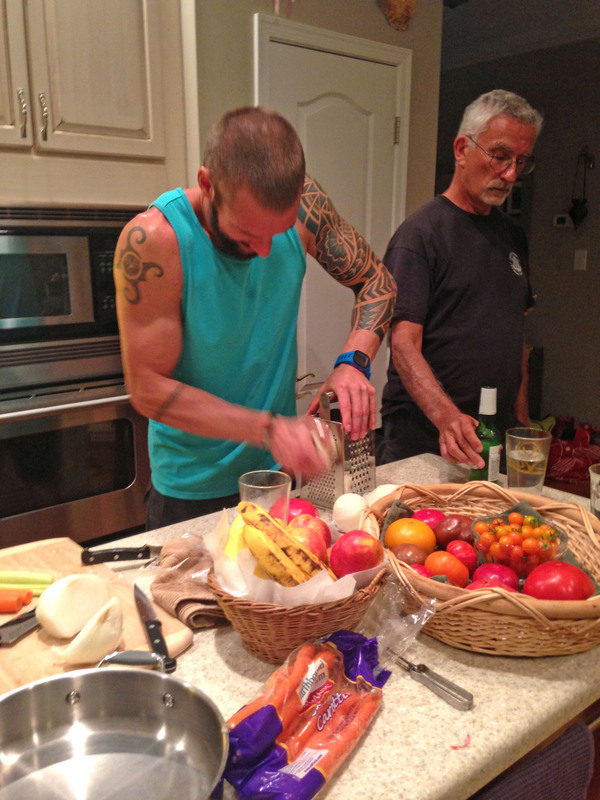 Here my mom and Roberto readying ingredients. Other than the tomatoes, there was only one other ingredient. Yes, you read that right. One. And it was AMAZING!!! We bought a pound of pancetta which Roberto diced taking care to get the meaty bites, not so much the parts that are strictly fat. This is where all your flavor comes from so don’t be afraid. You can see it there on the cutting board below. I’d say he used a little under 3/4 of the pound that we bought. Then he simply browned all the pancetta and added the two cans of San Marzano tomatoes which he ran through a food mill. Originally, the tomatoes in the pan looked very watery but he let them simmer away, do their thing, and reduce down to an amazing sauce. Once complete, it was just a matter of combining the pasta and the sauce in the skillet. Topped with pecorino, it was literally heaven in our mouths. 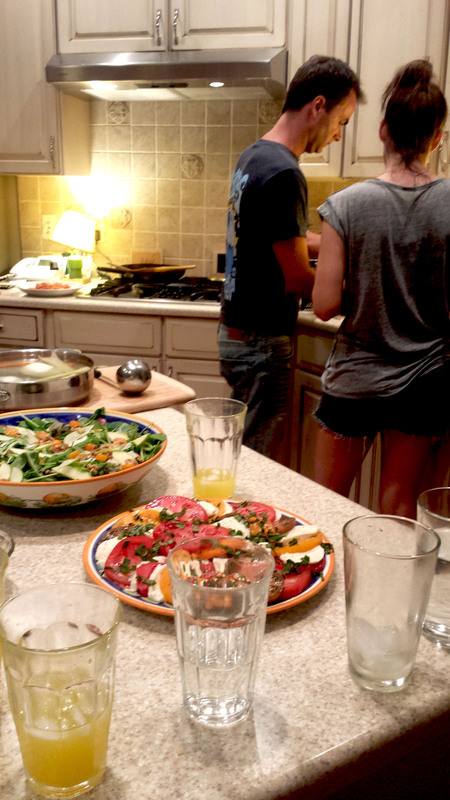 While Roberto was making pasta, I was working on some salads. 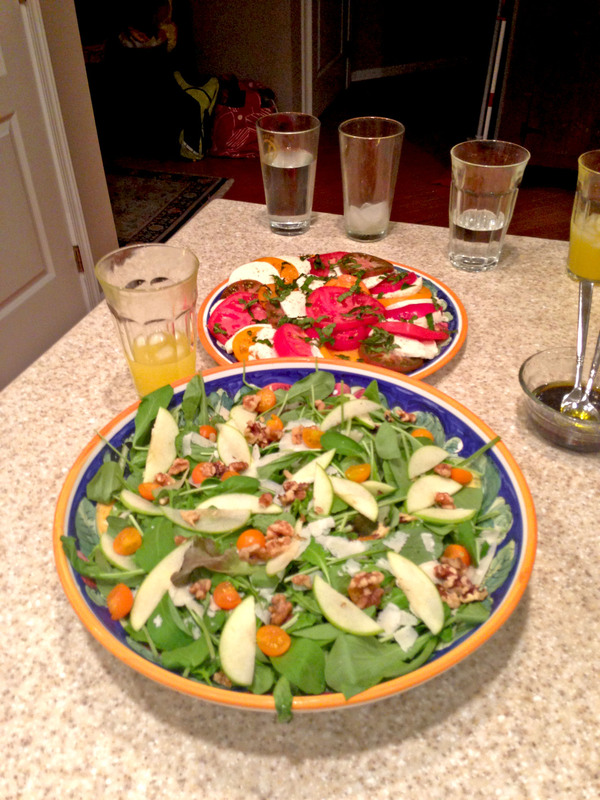 I settled on a mozzarella, tomato and basil salad with a balsamic vinaigrette and a green salad with thinly sliced apples, walnuts, yellow tomatoes, sliced parmesan and a lemon vinaigrette. So fresh tasting. While all this was going on, we were also making our Cacio e Pepe. 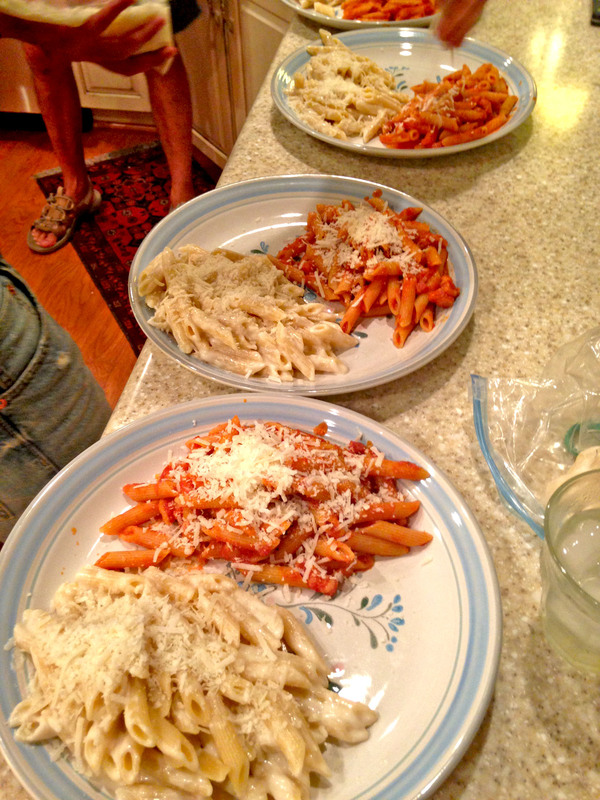 I would say we used both a medium-sized triangular rind of pecorino and parmesan cheese. It was a lot of shredding, but luckily my husband took on the task and it went very quickly. Then it was time to start on the “creamy” sauce. This sauce contained no cream, butter, olive oil…nothing! I was amazed. I never knew you could make a cheesy sauce this way. In a small pot, Roberto simmered one large onion chopped in half, one large carrot chopped in half and one large celery stalk chopped in half. We simmered that for about 1/2 hour to 45 minutes while everything else was going on. Then, we added our cheeses to the food processor and ladled out one spoonful of the onion/carrot/celery water to start. Blending away we slowly added more of the water to get the perfect creamy consistency. That’s it. Seriously. How easy is that? We then added some cracked black pepper, and mixed everything together in a large pan with a tiny bit more water. Here we are whipping things up in the food processor. Once combined with the pasta, it was time to serve it up! Pure excitement, let me tell you! 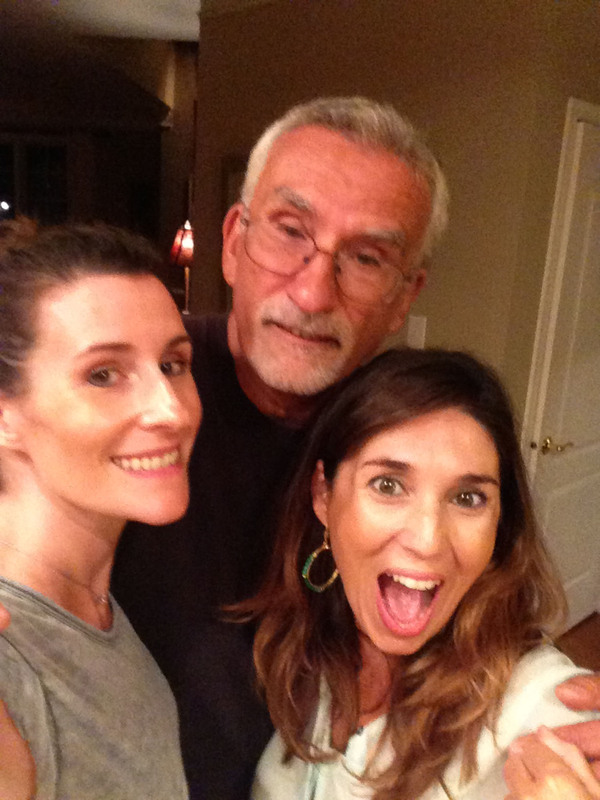 Here I am with my dad and Anna. Finally it was time to plate everything up. 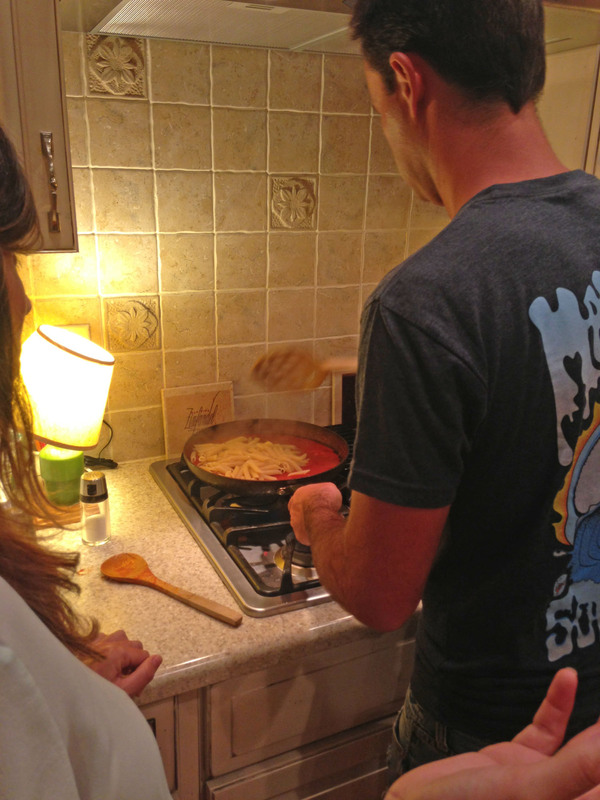 We had a TON of pasta and we ate it all. I mean, it was too good not to. How wonderful that so few ingredients could make something so tasty. Both these pasta dishes were my kind of recipes. Simple, authentic and using the best ingredients available. We had a wonderful dinner outside under the stars, candles lit, bugs-a-chirping, ocean breezes blowing in. A truly magical night of cooking. Thanks again Roberto! Salute! Awesome! 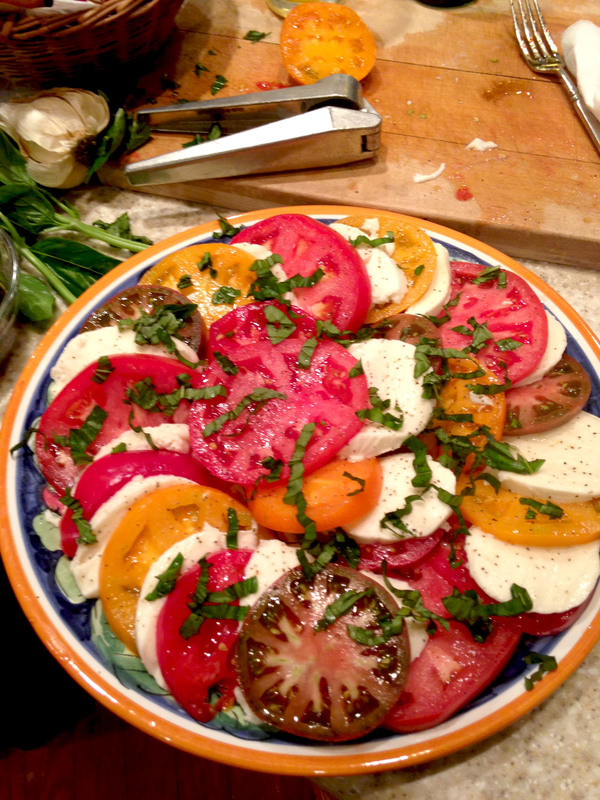 Look at that caprese!!! That looked awesome! Why do I always read your blog when I am hungry? I learned a lot! Thank you. What a wonderful dinner! So nice to spend our time with you! For sure! Love you guys!